It's a case of anything goes for fashion house Prada, with the launch of its Fall/Winter 2011 campaign. At the heart of the collection lies a free-for-all attitude to fashion maximalism, with velvet-lined trompe l’oeil boots, cherry-red heels, coral kid gloves and the orange glint of a mermaid scale dress all competing for attention. The campaign was shot by renowned Vogue photographer Steven Meisel, in the setting of a "sensuous playroom of childhood dreams." Rich velvet furnishings and a mosaic of colour, texture and smooth light are designed to give the campaign an other-wordly feel and a relaxed atmosphere of fashion at play. 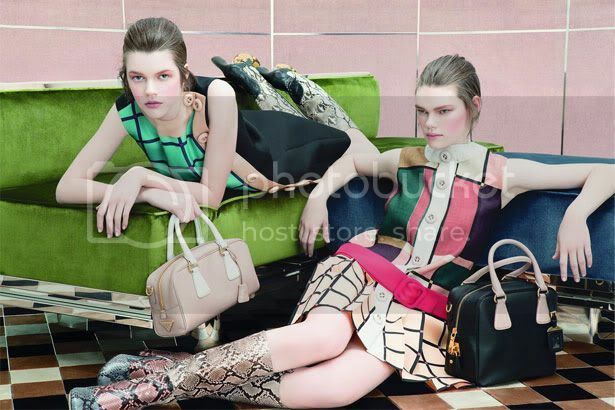 Take a first look at Prada's Autumn/Winter 2011 campaign images below.